I know that sometimes it can be hard to think of recycled trampoline ideas. Many of us have had a trampoline when we were kids, or we’ve bought one for our own kids. Either way, it offered us many hours of fun and laughter. But what to do with it when kids have all grown up or when it’s broken beyond repair? I’ve had the same problem and after days of pondering about how to repurpose our old trampoline, I’ve found some useful solutions. I’ve also asked neighbors and friends to see how they’ve dealt with it too, and they gave me some really good insights. Stay put, as we shall discuss many fun recycled trampoline ideas. Hopefully, you’ll find something that’ll work out for you too. You can recycle your trampoline in many ways. Of course, there are those that are the easiest, but before you go for them maybe you should think about repurposing it since with a little effort your trampoline can continue to serve you in many years to come. Recycling your trampoline may be the easiest solution. All you’ll need is to take it to the nearest recycling plant. However, make sure to call them first and see how to break it down. Many recycling plants have certain policies when it comes to that. For example, if your trampoline has a metal frame, it should be separated from the other parts. Especially because you’ll be able to get money for it. Another good option is to look for websites that offer recycling services. There are many on Google. If your trampoline is not in a really bad shape, you can try to sell it or swap it on some trading websites. Just make sure to post photos of it, and try to be honest about its condition. When it comes to the condition, you should always inform the other side whether your trampoline has any rusty parts. Rust can pose a real danger to its users especially because the metal frame becomes brittle when rusty. It can break easily when used. Always check your trampoline thoroughly and write down everything that is broken or in bad shape. All of the aforementioned also goes if you want to give away your trampoline. That can also be a great solution as you’ll probably think of someone that has kids and would be happy to have a trampoline. As a bonus, if you list it for free online you won’t have the obligation of delivering it. You can actually get money for the trampoline frame if it’s made out of metal. All you’ll need to do is to separate it from the other parts and take it to your local recycling plant. However, there are also many recycled trampoline ideas that can actually help you repurpose it. It can serve for many things. 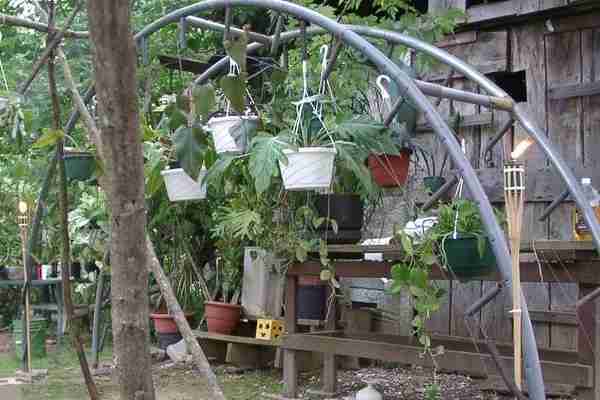 I suggest that you make a nice garden arch out of it. Round trampolines are the best for making one. They will provide a nice and sturdy construction for climbers to grow on. Just imagine lush vines in your backyard. Or how about honeysuckle roses? I personally have them and I can tell you that all of my neighbors envy their beauty. 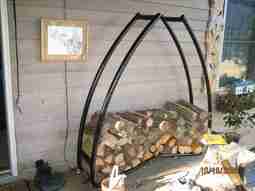 So, in order to make a garden arch, you’ll need to cut the frame in half. That way, you’ll basically get two arches. If you have some welding skills you can also join them with the legs from your trampoline. It will both look nicer and provide additional support for the frame. Square trampolines can be perfect for creating frames, holders and guess what: movie screens! Everyone loves movies, so why not make your own personal movie theater? I know, you’ll have to invest some money in the projector, but to be honest, this is probably my favorite repurposing idea. The trampoline frame is just perfect for making a big movie screen. All you’ll need is to attach a white canvas and place the frame on a wall and you are all set. You can also paint the mat in white, but personally, I wouldn’t advise you to do that. The paint will wear off in time, though it can be a fast solution if you’re planning to get your theater up and running in an instant. If you have small animals or chickens, another way to go about repurposing to make a grazing pen out of it. Just remove the mat and springs and turn it upside down. Cover the side and the top with a wire mesh and basically, You’re good to go. For detailed instructions read our Easy tips to build a trampoline chicken coop guide. So your trampoline is beyond repair, and kids are really sad. Well, until you buy them a new one, you can repurpose the one you have into a soccer goal! Trust me, your kids will love it. It will offer many hours of running around and fun. If your trampoline is square shaped, then even better! Otherwise, you might need some welding skills in order to make one. Now, if it’s square shaped, all you need to do is to cut it in half and flip it upside down. Make sure to place the frame firmly into the ground. Add some netting on the back and your soccer goal is all set. Most of the trampolines already have netting that you can use. However, if your trampoline is round-shaped, you might need to weld the legs together in order to make one. Visit our Easy tips to build a trampoline greenhouse for more information. You can always sell trampoline springs as spare parts if they are in good shape. You can also try to take them to the local recycling plant. They are made out of metal and I’m sure that they’ll accept them. However, you don’t have to get rid of them at all, since they can be repurposed together with other trampoline parts. 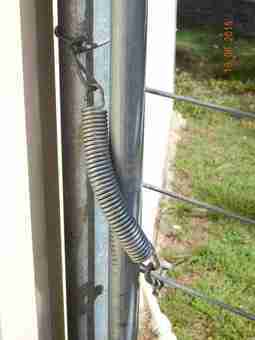 What’s more, maybe you can use those springs as a substitute in other objects if they are in good shape or the right size. Personally, my friend left them on its trampoline and made a nice bed. Not a real bed, but more of a daybed of sorts that sits in his back patio. 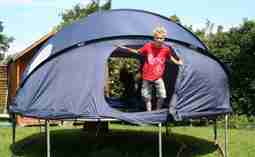 So, to make one you’ll need to remove the legs from the trampoline. That means even cutting them off if necessary. The next step would be to find some sort of cloth that would go around the edges. Sometimes they can have parts that might bother you so make sure to cover them well. A good idea is to also add some foam rubber first and then cover it in cloth. Now, find the right mattress that will fit and put it on top of it. Some covers or sheets can also be a nice addition. Pillows are great both for decoration and the overall comfiness. My friend suspended his bed in the air. He hung it from an anchor point. Just make sure that the wires are strong enough to support your weight. You’ll also need to join them with the frame. So make sure that they’ll sit tight. The last thing you’ll want is to have the bed untying and falling. Another way to use the springs is to create a shade for your patio. However, you’ll also have to remove the legs from your trampoline. If you have some welding skills, find poles that are long enough and weld them together with the frame. Place them firmly in the ground in your patio area and you’re all set. The mat on the trampoline will easily block the sun and give you a nice shade during hot summer days. So what to do with the mat if you use some of the aforementioned recycled trampoline ideas? Many of them don’t require the mat, right? Well, mats are usually made out of quality and durable materials that can be used for patching things up. If you don’t want to waste money on netting, you can actually use the mat to place it on the back of your soccer goal. To make things easier, you won’t even have to take off the trampoline once you cut it in half. Also, you can turn it into shades, and it can really help if you’re into gardening since it can serve as a great weed mat. It can also serve as a cover from rain for some things that you need to leave outside. Don’t throw it away. If you can’t think of any purpose now, something will surely come up in the future where you’ll need something just like that. I know that recycling your old trampoline may be the easiest way to get rid of it. But, you can actually benefit more from repurposing it. That’s why I wanted to share all these ideas with you. With little effort, your kids will be very happy, and you can actually make it be a fun family project for the weekend. Hang out, have fun, and make something nice and useful.